I grew up with herbal medicines in Brazil, inheriting the tradition of using herbs from my mother. As a child I never knew modern drugs – there was always a brew of herbs that would do the job. Herbs hung in bunches around our house, ever ready for healing our large family. For the last twenty years I’ve studied ancient traditions, especially those of Ayurvedic and Chinese medicines. This pursuit has taken me to India where I am fortunate to have studied with some of the most respected living teachers. This pursuit has been combined with the study of western herbal medicine and strengthened through a formal basis in contemporary science, medical health and physiology. Bringing these ancient and modern traditions together provides a deeper understanding of health. It enables an effective, complete and holistic approach to treatment, healing and deep wellbeing. Herbal medicines are gentle and safe – but they are also powerful. They should only be prescribed by someone who is suitably qualified. In 2002 I qualified in Herbal Medicine at the College of Naturopathic Medicine, in London, at which point I left my city career and set up my own practice as a Herbalist. 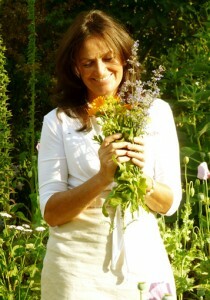 In 2009 I opened The Natural Pharmacie, a ‘Walk-in-Clinic’ which I ran for four years in Bradford-on-Avon, Wiltshire. While I continue to live near this town, I now work more flexible hours and cover more locations. Beyond this, I’m a woman – a businesswoman and wife. I know what it is to be in a woman’s body. I have an affinity with other women and it is women’s health – especially concerning hormonal imbalances – that I enjoy focusing on.